24 Electrics - Electrician based in Kinglassie, Fife. 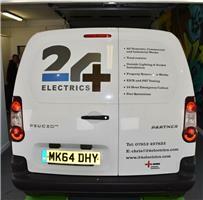 24 Electrics is a family run electrical contractors based in Fife. Owner Christopher Inglis established 24 Electrics around 4 years ago and continues to work hard making the buisness grow from strength to strength. Fully NICEIC approved contractor has over 10 years of experience. With the buisness making a name for itself in and around Fife 24 Electrics has accomodated the work load by growing the 24 Electrics team in order to make things run smoothly and efficently. One thing Christopher prides himself on it the quality and standard of work the 24 Electrics team can provide. Every customer is important to us no matter how big or small the job, from the minute a customer calls to book a free no obligation quote to the finalisation of the invoice on completion.All domestic,commerical and industrial works are undertaken at 24 Electrics. We also provide deals, discounts and packages.